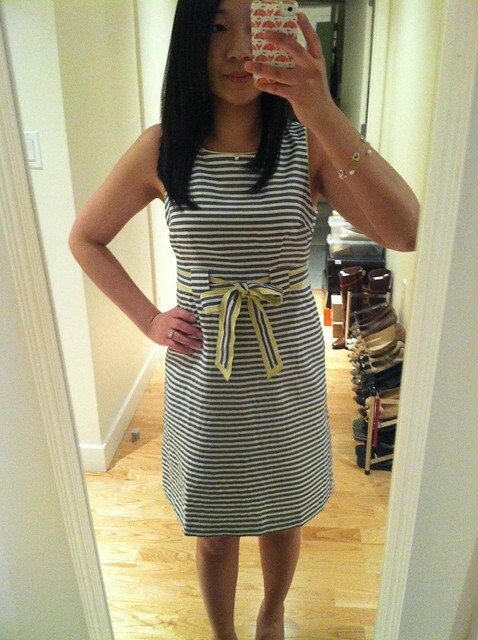 Continuing my reviews from my outlet purchases this past weekend is this striped dress from LOFT. I’m a very quick shopper (most of the time) and I usually do a quick walk through of a store from front to back. Sometimes nothing will catch my eye and I’ll leave as quickly as I entered the store and other times I’ll see a few things that warrant closer inspection. 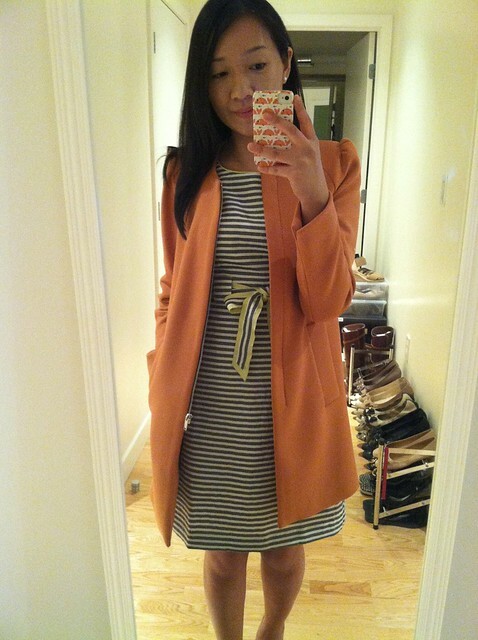 The cute yellow and striped bow on the waist of this dress totally caught my eye so of course I had to try it on. This dress has a looser a line skirt (21″ at the bottom hem) so if you like your dresses to hug your curves then this dress is probably not your cup of tea. I also love the yellow piping that outlines the neckline and arm holes. Size 00P measures approximately 16″ in the bust and 13 1/2″ in the waist (measurements taken with the garment laying flat). The only thing that would make this dress even better for me is if it had pockets. 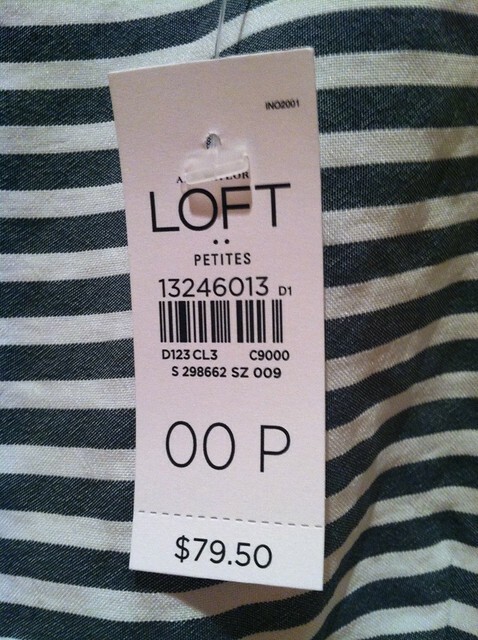 Here is the tag in case you want to call your local LOFT outlet to locate this item. Again, I combined my purchase with my friend for additional savings so I got this for around $55. 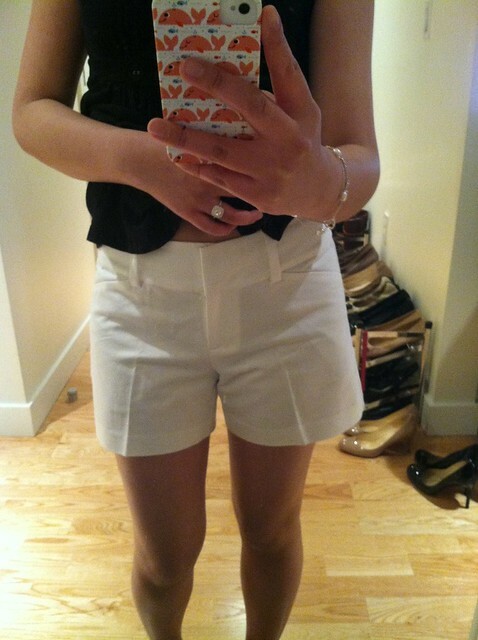 There was a 50% off promotion on everything in store so I got the white shorts for $22.50 and passed on the other two. I realized that today marks the one year anniversary of my blog and this will serve as my 100th post. As mentioned in this post, I originally started blogging in order to sell my gently worn/loved items (see my very first post here). While I sold only a few items via my blog (mostly J.Crew) I found that I blogged the most about what I bought rather than what I wore. I’m guilty of struggling to understand the purpose of my blog but my hope is to share more of my outfits this year and to live up to my blog’s namesake. It’s a fact that I’m notorious for being non-committal about most things that I do for myself so I’ve surprised myself by committing to blogging this long. I’ve been blessed to make the online acquaintance of some very special lady friends through blogging. I’m equally grateful for the support of my lovely readers. I’ve learned a lot from the blogging community this past year and sharing the things that I love has helped me in more ways than I can ever put to words. Thanks so much, Yi-chia. Yes, the dress is from LOFT outlets and I got it at Wrentham. They carried it in both the regular and petite sizes. 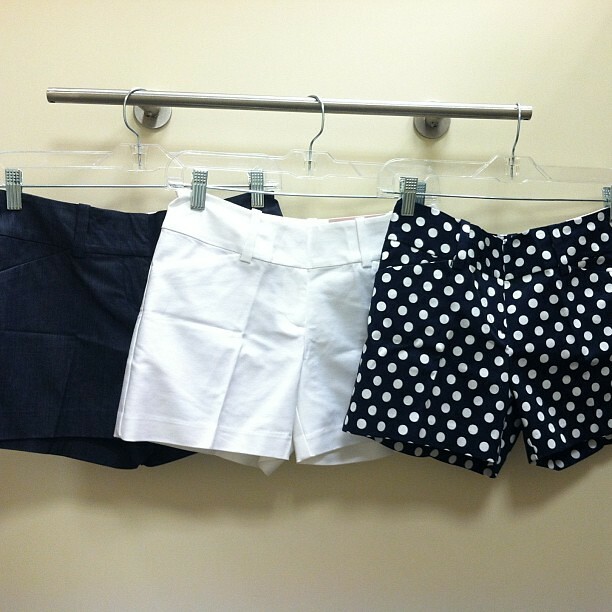 The signature shorts including the polka dot ones came in at least 6 colors if I remember correctly. They also came in both regular and petite sizes at AT Factory. FYI. There is a AT Factory in Watertown too! I love that dress! I've gotta go try it on. Congrats on the anniversary, I just started my blog and I hope I can get to a year without quitting in the middle. And so you should. Woodbury Commons is an epic outlet in NY. Puts every other outlet to shame. Thanks Samantha! It was so bitingly cold today. 🙁 Where is spring? 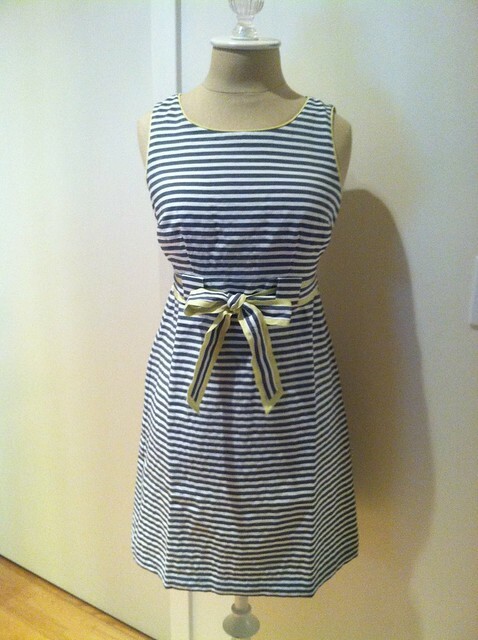 Happy blog birthday and thanks for showing the Loft nautical dress. I will have to check it out! congrats on your 1st year of blogging! Thanks so much, KC! I really appreciate your support.